Cogeferm, a French business specialising in carpentry and locksmith materials, has chosen to work with Mecalux yet again to expand its miniload warehouse for boxes. This extra miniload storage aisle lets the company store more than 7,980 boxes. Likewise, by setting up this third automated warehouse for boxes, and a new pick aisle, the business increases its cycles/hour by 50%. The automated miniload warehouse is allocated mainly to picking small and low demand products, as well as a portion of the consumer products. The whole picking-related process starts in this area and is headed up by the Easy WMS. Moreover, the 3,000 m2 logistics centre of Cogeferm, located near Paris, also features live racking for boxes and pallets, pallet racks, picking shelves and cantilever racking for very long products. 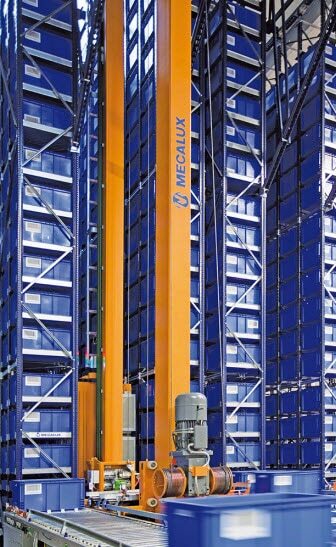 Everything was supplied and installed by Mecalux. Founded in 1987, Cogeferm is an expert distributor of carpentry and locksmithing materials. The company has a team of 150 employees and 17 points-of-sale spread throughout France, where it sells the +20,000 SKUs it carries. Its quick delivery service and efficiency make Cogeferm a force to be reckoned with in this French sector.